First comes chicken, then comes marriage? Be skeptical if you must, but this recipe may be charmed. 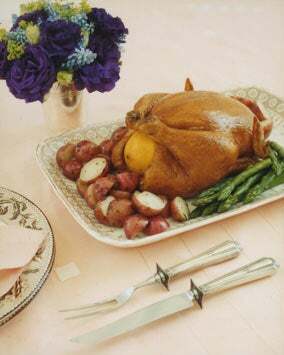 It all began 26 years ago, when then-Glamour fashion editor Kim Bonnell gave the recipe to her assistant, Kathy Suder, who made the chicken for her boyfriend, who, a month later, asked her to marry him. “It’s a meal your wife would make. It got me thinking,” says Jon Suder, who now has three children with Kathy. Details of the simple dish passed from assistant to assistant like a culinary chain letter. When Bonnell heard that her recipe had inspired three weddings, she dubbed it Engagement Chicken. Try the recipe, give it to a friend—oh, and let us know when it works! What's the recipe you ask? 1. It's CHICKEN that will make a man marry you? Chicken?! Chicken is the chicken of meat! 2. There's nothing interesting in this recipe! If someone made this, I'd think "Wow, are they trying to kill my tastebuds by boredom?" 3. A chicken is what makes someone want to marry you? Not emotional stability? Not the ability to make you laugh? Not bedroom skills? Chicken? 4. This came from Glamour...not sure I'd trust them on cooking. 5. If the chicken was so damn good, why'd it take a month to get engaged? 6. The chicken looks like it's passing that lemon...it makes me want to do the opposite of eat. But really, what annoys me is the idea that getting married is the MOST important thing in a lady's life and clearly the only way to get married is by showing what a good Stepford wife you'd be.